- Publisher Volume XIV of the highly respected "Theological Dictionary of the Old Testament" expands the scope of this fundamental reference tool for biblical studies. Ranging from guilt to settle, dwell, these seventy-seven articles include thorough etymological analysis of the Hebrew roots and their derivatives within the context of Semitic and cognate languages, diachronically considered, as well as Septuagint, New Testament, and extracanonical usages. Among the articles of primary theological importance included in Volume XIV are these: adversary, hate, Sheol, ask, rod, staff, tribe, Sabbath, and turn around . Each article is fully annotated and contains an extensive bibliography with cross-references to the entire series. 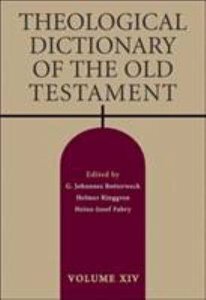 About "Theological Dictionary of the Old Testament (#14 in Theological Dictionary Of The Old Testament Series)"
Volume XIV of the highly respected "Theological Dictionary of the Old Testament" expands the scope of this fundamental reference tool for biblical studies. Ranging from guilt to settle, dwell, these seventy-seven articles include thorough etymological analysis of the Hebrew roots and their derivatives within the context of Semitic and cognate languages, diachronically considered, as well as Septuagint, New Testament, and extracanonical usages. Among the articles of primary theological importance included in Volume XIV are these: adversary, hate, Sheol, ask, rod, staff, tribe, Sabbath, and turn around . Each article is fully annotated and contains an extensive bibliography with cross-references to the entire series. (1917-1981) Former professor of Old Testament and Catholic Theology at the University of Bonn in Germany.